Wash and soak Chana dal in water for 30 minutes. Pressure cook the dal, add salt, turmeric powder, water to it for 1-2 whistles. The dal should be firm to touch but it should be cooked. Soak the Soya chunks in hot water for about 10 minutes. Strain and squeeze the excess water and keep aside. Heat oil in a pan and fry the soya chunks till golden brown in colour for 5-8 mins and sprinkle a little salt over it. Remove it from pan and keep aside. Heat oil in a deep pan or kadhai. Add 1/2 tsp of sugar to it, when it turns brown in colour add cinnamon stick, cloves, cardamom and bay leaf. After one minute add cumin and mustard seeds to it, also add hing (asafoetida). When it starts crackling, add finely chopped onion and fry. Then add ginger-garlic paste, turmeric powder, tomatoes, red chilli powder, curry powder, coriander powder, kasuri methi and stirring well continuously for 5 minutes. When it changes its colour, add soya chunks and boiled potato pieces to it and saute a while. Then add boiled Chana dal to it and mix well. Add water and Cook for 10 minutes on a medium flame. Simmer till the dal becomes thick. Now add garam masala, stir well and further cook for 2 minutes. Switch off the flame and garnish with chopped coriander leaves. Serve 'CHANA DAL-SOYA NUGGETS CURRY' with chapati, parathas etc. Eat healthy and live healthy !!! 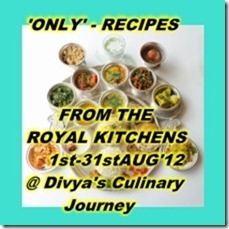 Pari's event "Only From Royal Kitchens" at Divya's Culinary Journey.